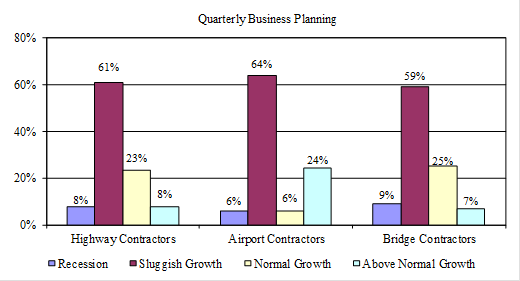 Although contractors are reporting some positive market trends in the second quarter of 2014 compared to the same time period in 2013, many respondents to the ARTBA Quarterly Transportation Construction Industry Conditions Survey also indicated a pullback in state bids for contract work as the uncertainty of the Highway Trust Fund continues to impact the market. Over half of survey participants (63 percent) expect sluggish growth in the transportation construction market in the coming year. About 7 percent of participants expect a recession and 30 percent expect normal or above normal growth for the next 12 months. Project delays continue to impact most contractors, with 49 percent reporting design or owner-related problems, up 12 percentage points from the previous quarter. Nearly 60 percent of respondents reported delays due to weather. Most contractors (64 percent) reported having the ability to take on more work. Absent new revenues, the federal aid program will not be able to support any new projects in fiscal year 2015, which starts October 1. Thirty-five states have publicly said they have or may consider canceling or delaying projects during the 2014 construction season if Congress does not resolve the situation soon.